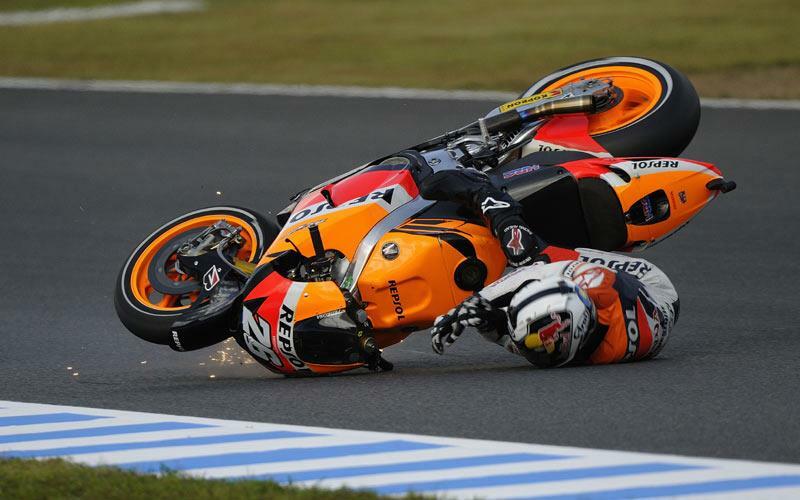 Dani Pedrosa has ended speculation that he will make a shock return to MotoGP action in Sepang this weekend. Rumour spread like wildfire in the Sepang paddock earlier today that Pedrosa would make a shock return when Spanish TV staff claimed to know that Pedrosa was preparing to board a flight from Europe to Kuala Lumpur. It was only six days ago that the Spaniard’s world title hopes were ended when he smashed his left collarbone in a big crash during opening practice for the Japanese Grand Prix at the Twin Ring Motegi. Repsol Honda staff confirmed Pedrosa had contemplated the option of flying to Malaysia and riding from Saturday practice onwards with the 12-hour flight and time difference meaning he wouldn’t have arrived in the Far East until Friday morning. But Repsol Honda finally confirmed that the 25-year-old will miss this weekend’s Sepang race and continue with plans to make his comeback at the Phillip Island round in Australia on October 17. A team statement said: ‘It has been confirmed today that Repsol Honda Team rider Dani Pedrosa will not take part in this weekend’s Malaysian Grand Prix. 'Pedrosa underwent surgery on Saturday to fix a titanium plate to the collarbone he broke during practice for last weekend’s Grand Prix of Japan. After the successful operation, there was a very slim chance that the Spaniard would be fit enough to make the journey from Barcelona to Malaysia and attempt to take part in this weekend’s MotoGP race. 'However, after careful consideration, Pedrosa has made the understandable decision to stay at home to continue his recovery. The target for his return remains the Australian Grand Prix, practice for which begins on October 15. With Pedrosa absent, Fiat Yamaha rider Jorge Lorenzo can wrap up his maiden world title on Sunday. He only needs to score six-points to become only the second Spanish rider in history to win the premier class crown.